How can you reduce business energy waste, boost profits and cut carbon emissions? For most businesses an in-house energy manager would be key to unlocking big energy savings, however, this is not usually an option for all but the largest organisations. SMARTech energy can provide the next best thing – our SMART Energy Management Service. Through this holistic service, our team of Energy Consultants work with you on an on-going basis. Their goal is simple. Reduce energy waste, boost profits, cut carbon emissions. Energy saving targets are set at an early stage of the partnership, and using our proven nine step methodology energy consumption reductions of 30-50% are common in the first year. 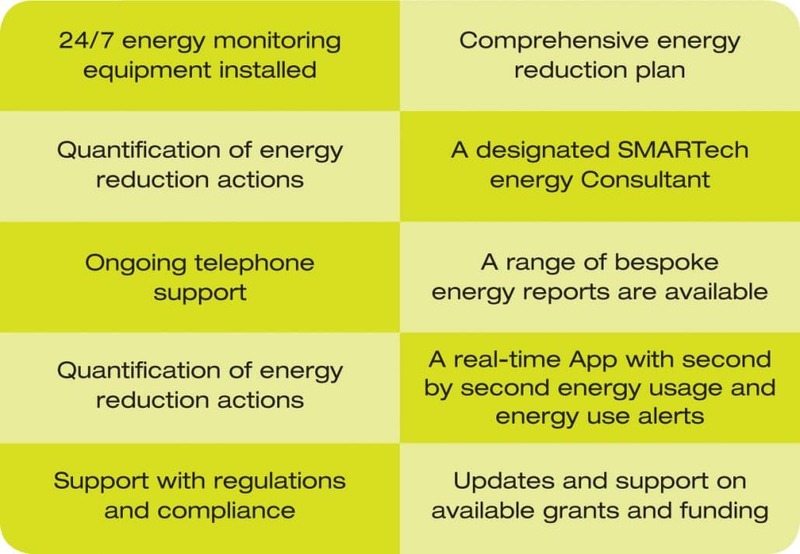 Whilst energy saving is the primary goal, our energy management programme also provides a range of other benefits. Ongoing, 24/7 energy monitoring; regular management reports; rich analytics to inform your business decision making; quantification of energy savings and ongoing support from our team of Energy Consultants all form part of the service. Just think of us as your part-time energy manager. You can’t manage what you can’t measure. SMARTech energy has the solution… Real Time Energy Monitoring. Up to 43% of global energy consumption is going to waste as a result of inefficient equipment and business practices. Without a reliable and accurate way to measure ongoing consumption, organisations have little chance of preventing waste. We install Eniscope, the best in class real-time energy management solution providing: 24/7 second by second monitoring of energy consumption and quality providing minute by minute analytical and diagnostic data. Engineered to allow continuous, remote monitoring with data being able to be viewed in real-time on any computer, or across a range of mobile devices. Accurate measurement of up to 30 electrical parameters with the potential to also read existing meters (e.g. gas and water). Easy to understand graphic displays with an App interface for smart devices. The rich analytics that are generated supports SMARTech energy to develop an in-depth understand about HOW, WHEN and WHERE energy is being used and, most importantly, wasted. The analytics generated from monitoring combined with data generated from an in-depth energy audit carried out by our in-house ESOS approved assessors allow us to identify energy saving opportunities for our clients. Typically, our energy saving plans identify energy reduction opportunities of 30-50%. Having identified energy saving opportunities, we then develop solutions. Some of these will be no cost or low cost solutions – often changing peoples behaviour and practices can deliver big savings. Other solutions will require new energy efficient technology. For each of our recommendations we quantify the energy saving potential, the costs of implementing the solution, the resulting carbon reduction and the pay back period. Our Energy Consultants then work with you to develop an energy plan which supports your business plan. We then work with you to implement the plan to start to achieve targeted saving. For each solution implemented, with the aid of the state of the art monitoring equipment already installed, we measure and quantify the achieved savings and report back. Our team have worked with organisations large and small across many different sectors. Our clients include PLCs, SMEs, public sector organisations and charities. Having helped leisure parks, colleges, retailers, hotels, printers, manufacturers, plastic moulders, engineering companies, professional service firms, bus companies, a residential care organisation, charities, fitness centres and a County Council reduce their energy consumption our team have the breadth of experience to add value to any enterprise. As your energy management partner, our team monitor your energy usage on an ongoing basis. This allows us to spot changes in consumption or in a range of power quality measure and help to address the situation quickly. As a result, energy waste is averted or early action taken to prevent an interruption to your business. Furthermore, with the constant changes to regulations and obligations facing businesses, our team are on-hand to help keep you compliant. And as your business needs change (for example, planning to install new machinery or extend your premises) our consultants will help you plan and implement the energy requirements of your strategy. Saving energy is easy when you can see exactly how you are using it. Real Time Energy Monitoring.